In the run up to International Coffee Day (September 29), award-winning Delifonseca has teamed up with independent speciality coffee roasters Neighbourhood Coffee to create its own premium house espresso blend. The exclusively named ‘Delifonseca Espresso Blend’ will be served at Fonseca’s ‘Downstairs’ Café Bar, located between the edge of the central shopping zone and the city’s business district. Set to become a popular choice with customers at the Stanley Street venue, the blend will also be available at the Dockside eatery and stocked for purchase at its popular in-house food hall. Proprietor of Delifonseca Candice Fonseca said: “I’ve known the guys behind Neighbourhood Coffee for many years and they are as crazy about good food and drink as I am. Not only that, they have been international coffee traders for the last five years so their detailed knowledge from green bean to final roast is impeccable. 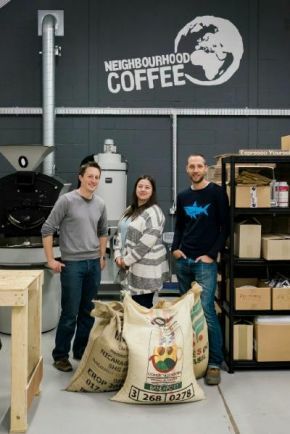 I was so pleased to hear that they were taking the leap and setting up a roastery on their home turf in Liverpool and jumped at the chance to work with them to create a new Delifonseca product. Neighbourhood Coffee roasts the finest Arabica coffee while maintaining strong relationships with its coffee-producing communities to ensure the best quality working conditions for its suppliers, which sits perfectly in line with Delifonseca’s ethos for delivering ethically sourced food and beverages. All of Delifonseca’s venues, including both restaurants and the food hall, pride themselves on their responsibly sourced products, award-winning independent vendors such as Butchers Broughs, in addition to their extensive range of artisan food and beverages.